It is said that you never know where inspiration may come from. That statement is ever so true when applied to this journey that has become the BlackPrint Project. You are witnessing the evolution of an idea that was originally sparked by a TV commercial. A commercial that asked one, simple question: What if we treated our families as businesses? As a concept, the BlackPrint Project is organized around the principle that Black progression is tied, most significantly, to Black economic development. But the scope of our challenges as a collective cannot be fully perceived until one looks at the bigger picture. We all know the narrative: Blacks are poverty stricken, prone to criminalization and disorganized. Then it hit me: We need a defined agenda. A list of our demands as a collective to our elected officials. A list of actionable priorities we could hold those who sought to represent us accountable for achieving. Now keep in mind, my list was just a rough brainstorm. No real thought process. No polish. simply the first few things that came to mind, put to paper. Then I started my research. It turns out, a group of prominent Black "leaders" had recently created a Black Agenda that it presented to the White House in February of this year. Now, don't get me started on why it took six years for our "leaders" to finally create an Agenda for us as a collective, to present to the first Black President. In fact, the realization that we have been operation without an Agenda for the better part of the last 40 years is the singular representation of everything that is wrong with our mindset. Now there are those who will say that our concerns are the same as every other group in this country. And while our challenges may be similar, Blacks in America are subject to an entirely different set of standards than a majority of the general population. It is with this in mind that an Agenda becomes necessary, both to hold those who "represent" us accountable, as well as to hold us accountable to ourselves. A quick comparison of my hastily created notes and the official Black Agenda reveals three points where both lists are in complete agreement. An while progress has been made in addressing some of the concerns outlined, the reality is, a vast majority of us are adversely affected by each and every priority listed. This Agenda is not only for the President; Obama now, and whomever may succeed him. This is OUR Agenda for every level of political engagement. At the national, state and local level, these are the issues that we will be holding every elected official responsible for addressing. These five priorities will serve as the guiding light for us as a collective. It is our compass. Our map. It is how we will navigate our way through the Black in America experience. 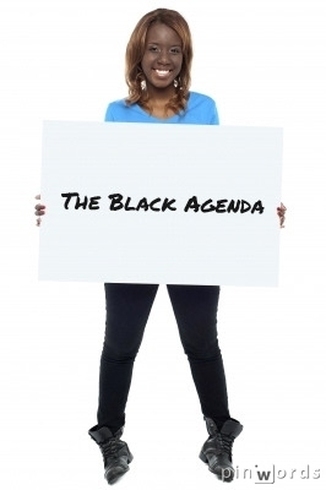 Take a few moment to review the Black Agenda. I feel it covers our major concerns. Most of the issues that are missing can be categorized under one of the existing five Agenda points. But I'd love to get your feedback. What did they get right? What did they get wrong? What did they miss?